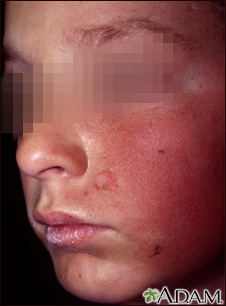 The term "dermatitis" describes an inflammatory response of the skin, caused by contact with allergens or irritants, exposure to sunlight, or by poor circulation, even stress. 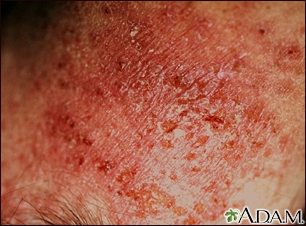 An example of contact dermatitis is the reaction of a sensitive person's skin to poison ivy, oak or sumac. 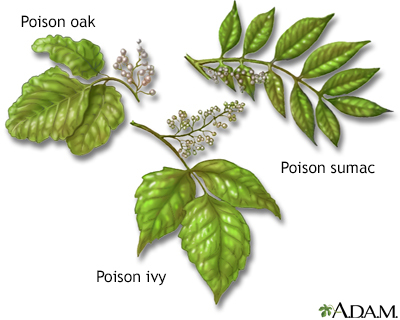 Contact with these plants, which contain a chemical called urushiol, produces an itchy rash, redness, blisters and scaling. AVOID SCRATCHING. 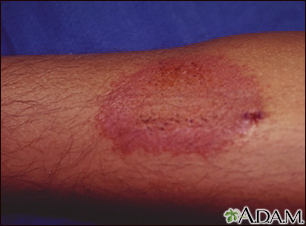 Scratching the rash may spread the inflammation, lead to infection and even leave scars. 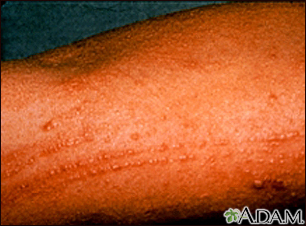 The metal, nickel, can cause inflammation (erythema), rash, and itching. 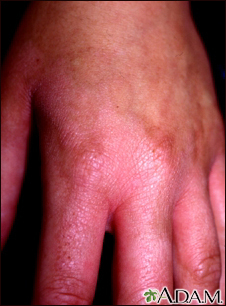 Nickel dermatitis is relatively common, and can be seen on the wrist from the stainless backs of watches, on the earlobes from nickel plated earrings, or elsewhere on the body from snaps. This person was in contact with something made of nickel or containing nickel salts.